With an Android device left at its default settings, your location history is automatically recorded. You can view and manage this data, but the simple interface of points plotted on a map leaves a lot to be desired. Developer Theo Patt realized this, and created a tool that allows you to visualize your location history in a simple, yet effective manner. Rather than points on a map, Patt's Location History Visualizer displays an interactive heat map that makes it easy to tell exactly where you've spent most of your time. Patt's website is best viewed on a computer, so head to this link from your desktop or laptop to begin. As the instructions in the middle of the page inform you, you'll need to head to Google Takeout to download a hard copy of your location history. By default, Google Takeout will make you a copy of all the data generated by various Google services. Since we're only concerned with Location History data here, simplify things by clicking the Select None button at the top of the screen. From there, scroll down to the bottom of the list and select only Location History, then click Next. On the next page, leave everything set to its default value, then click Create Archive. After a few seconds of processing, your file will be ready. Click Download to save a copy of your location history to your hard drive. Next up, head to your computer's Downloads folder and open the takeout.zip file. 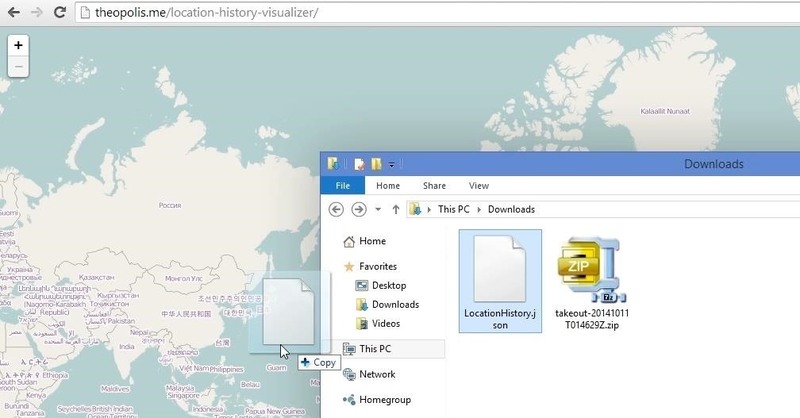 From here, extract the LocationHistory.json file to a folder that you can easily access. Next up, head back to the browser window with Patt's Location History Visualizer website open. From there, grab the LocationHistory.json file and drop it right on top of the website. Your location history will be analyzed entirely on your end of the connection, so you don't have to worry about your data falling into the wrong hands. At this point, you'll see your location history represented as a heatmap. Red areas represent the places you frequent most, and blue areas are the locations you've visited less often. The map is interactive, so the hot zones re-render as you zoom in to expose more detail. This is certainly a better way to view your location history than Google's own implementation. With heatmaps instead of plotted points, you can easily see where you've spent the most time. Did your location history visualization hit you with a wave of nostalgia like it did me? Let us know in the comments section below, as well as on Facebook and Twitter.